Can you imagine taking chocolate, extra virgin olive oil and sea salt and coming up with a decent dessert? Well how about one that is simply amazing? As part of the Foodbuzz Tastemaker program I recently received samples of Crisco's Olive Oil varieties and wanted to find a recipe that really showed off the great flavor. This tart contrasts the sweetness of the chocolate and the savory flavors of the olive oil and sea salt resulting in a deep flavor that I never would have expected. For Valentines Day, I tackled a meat dish I've been wanting to make for some time now. I'm a big fan of Hell's Kitchen and every time I see them slice into those perfect, (or not so perfect, accompanied by strings of profanity) Beef Wellington's, my mouth starts to water. I don't know why I haven't made them before today but I got the last available package of Filet Mignon's from Costco and knew tonight was the night to go for it. Now that the Super Bowl is over, it's time to start thinking Valentine's Day. What better way to show your love for that special someone than to create this beautiful torte. 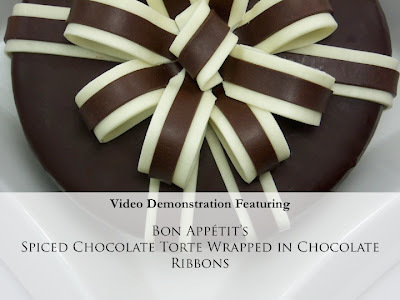 Three wonderful layers of sweet chocolate spice cake layered with light fluffy buttercream, covered in a rich chocolate glaze and then perfected with black and white chocolate ribbons. While typically branded as a holiday cake, there is no reason why this cake can't be the centerpiece at a birthday, celebration or in this case, an intimate Valentine's dinner. Just in time for your Super Bowl party, these Parmesan Twists will make a great addition to any party and are a great finger food you can just set out and let people enjoy. The gorgonzola gives it that little bit of bite, the puff pastry is a perfect flaky crust and the prosciutto adds the sophistication that will keep people coming back for more. My Mom and Dad spent part of the Christmas Holiday in Jackson Hole Wyoming and shared the following story from their experience. I'm excited to try this for myself and also visit Q Roadhouse next time I'm out there! No vacation is complete for my husband and me without the satisfaction of discovering yet another amazing restaurant. On a recent day trip from our cabin in Freedom, Wyoming up to Jackson Hole, we called our food blogger son, Matt, to ask him to research the top recommended restaurants there. The Snake River Grill was at the top of the list, but was only open for dinner and we were starving at 4:00. Heading towards the Teton Village Ski Resort, Q Roadhouse Restaurant caught our eye, so we decided to give it a try. Turns out, the chef there, Roger Freedman, opened Q Roadhouse in 2006 after having successfully lead the kitchen at The Snake River Grill to become one of the pre-eminent restaurants in the Rockies. Chef Roger takes an average looking “roadhouse” to culinary heights.